Author: Stross, Charles Set In . . .
Miriam Beckstein is a young, hip, business journalist in Boston. She discovered in The Family Trade and The Hidden Family that her family came from an alternate reality, that she was very well-connected, and that her family was too much like the mafia for comfort. She found herself caught in a family trap in The Clan Corporateand betrothed to a brain-damaged prince, and then all hell broke loose. Now, in The Merchants' War, Miriam has escaped to yet another world and remains in hiding from both the Clan and their opponents. 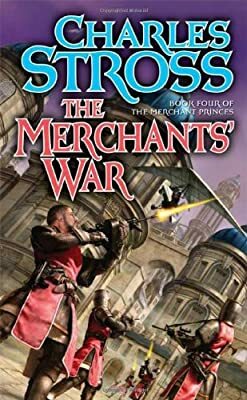 There is a nasty shooting war going on in the Gruinmarkt world of the Clan, and we know something that Miriam does not; something that she's really going to hate--if she lives long enough to find out.